While delegates from 192 countries convened in Copenhagen to hammer out a new climate-change treaty, the fashion industry had a group huddle of its own about the state of the planet on Wednesday. Held at the Danish capital’s renowned opera house, the Fashion Summit rallied together representatives from the likes of Barneys New York, EDUN, and H&M before finishing off with a runway show—and design contest—that featured 20 designers from five Nordic nations. Finnish designer Saara Lepokorpi’s two-piece collection, dubbed “Supermassive” for its astronomical and negative-space-inspired roots, beat out a cavalcade of sustainably stitched garments to secure the prize money of 50,000 kr ($6,720). “Supermassive” was inspired by astronomical concepts and negative images of space. 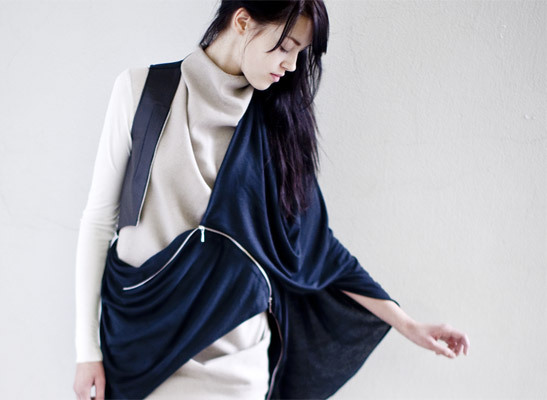 Made from organic wool, sustainable viscose, Ingeo, and Milkofil, Lepokorpi’s two ensembles can be draped in several different ways according to the wearer’s whim. “This way one garment’s usability is increased,” she adds. The ensembles can be draped in several ways, according to the wearer’s whim. The Fashion Summit was organized by the Nordic Fashion Association, together with CLASS, which sponsored the fabrics used. While delegates from 192 countries convened in Copenhagen to hammer out a new climate-change treaty, the fashion industry had a group huddle of its own about the state of the planet on Wednesday. Held at the Danish capital's renowned opera house, the Fashion Summit rallied together representatives from the likes of Barneys New York, EDUN, and H&M before finishing off with a runway show�and design contest�that featured 20 designers from five Nordic nations.